Apps(?) 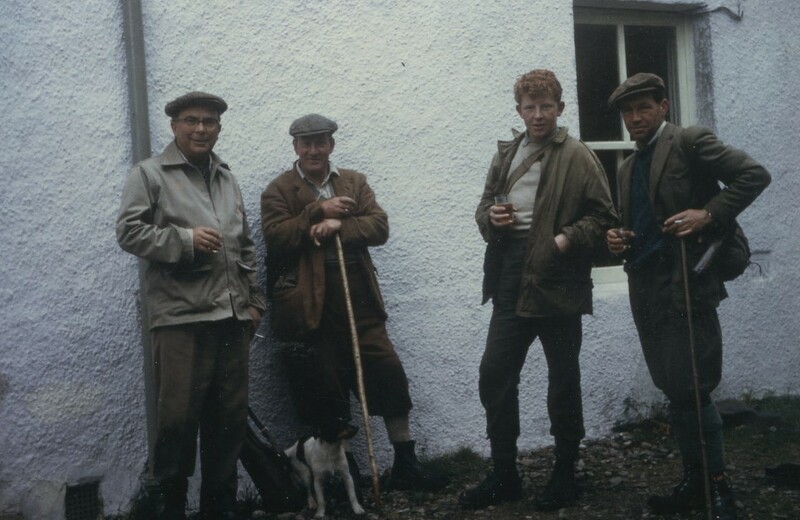 forms	A superior stone and slated building situate about 3 miles from the head of Loch Fyne, made as shooting lodge by the proprietor G F H(?) 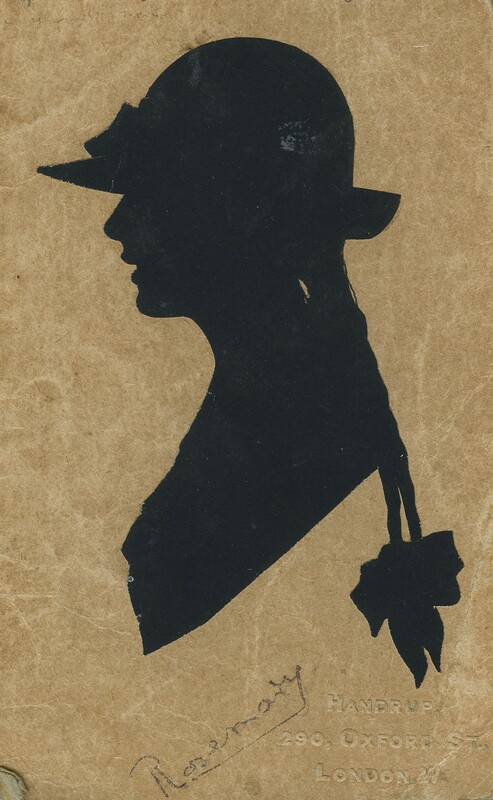 Callander Esq. 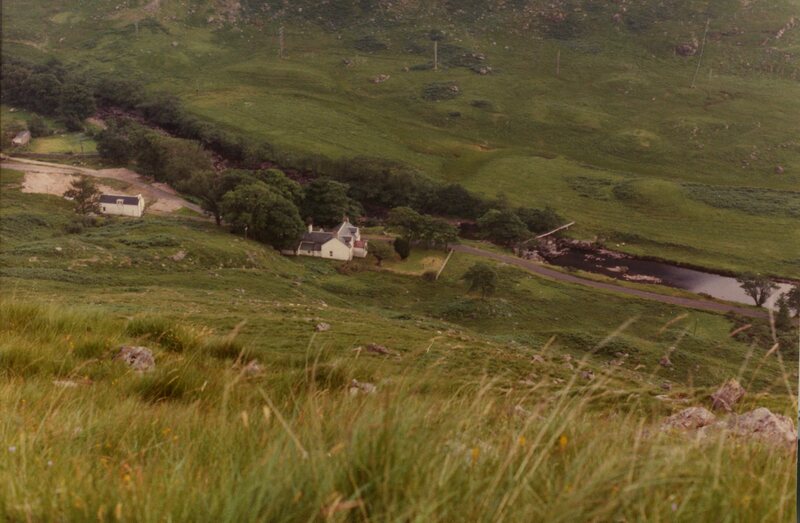 of Ardkinglas. 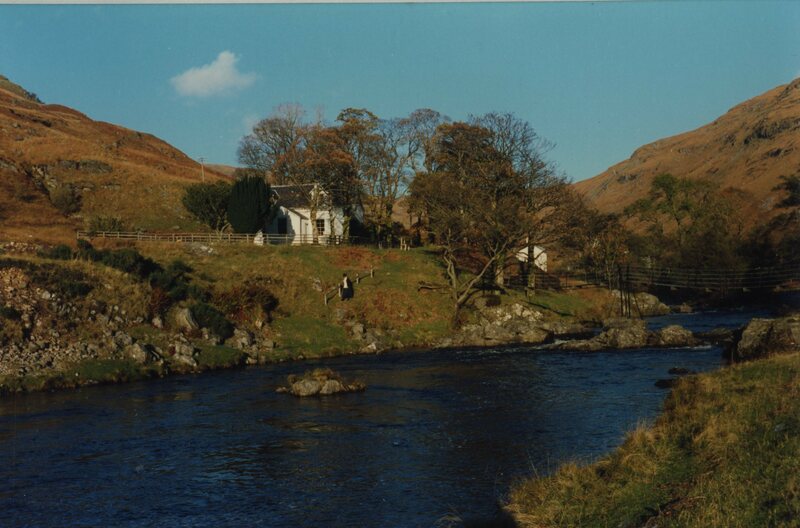 Glen Fyne Lodge is a large, well proportioned, T-plan house whose principal accommodation lies in the head of the ?T?. 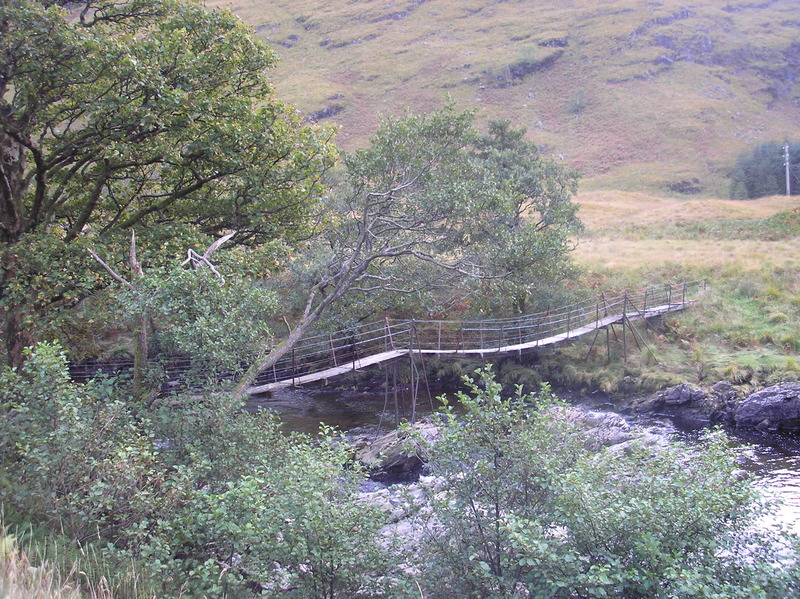 Its principal elevation is to the west, where its slightly elevated view is down Glen Fyne. The stem of the ?T? contained the service areas and ancillary spaces; this is a long eastwards-running jamb. 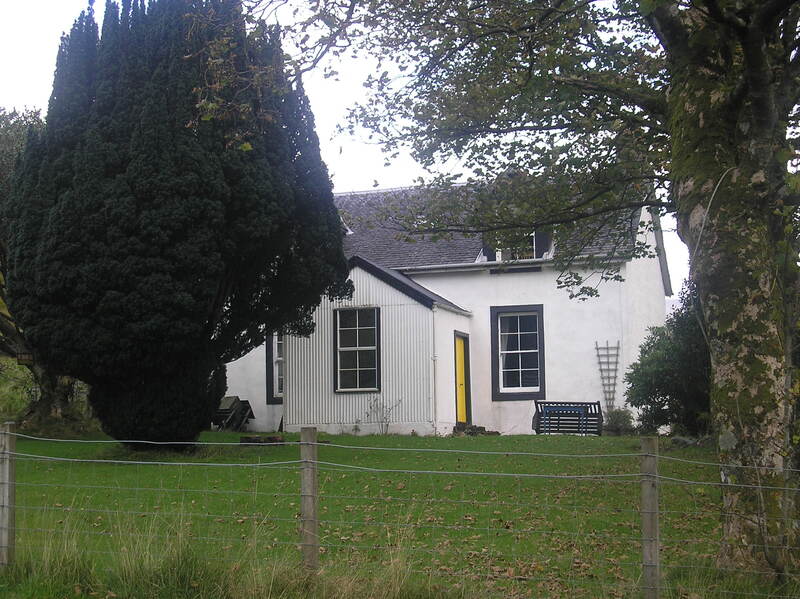 The whole building is of one and a half storeys and rendered and harled externally. The principal elevation to the west has been rendered and this rendering ruled out to appear as ashlar. The entirety of the rest of the building is harled. The building has recently been renovated with the principal accommodation to the west having been completed; the remainder of the building is still awaiting renovation. 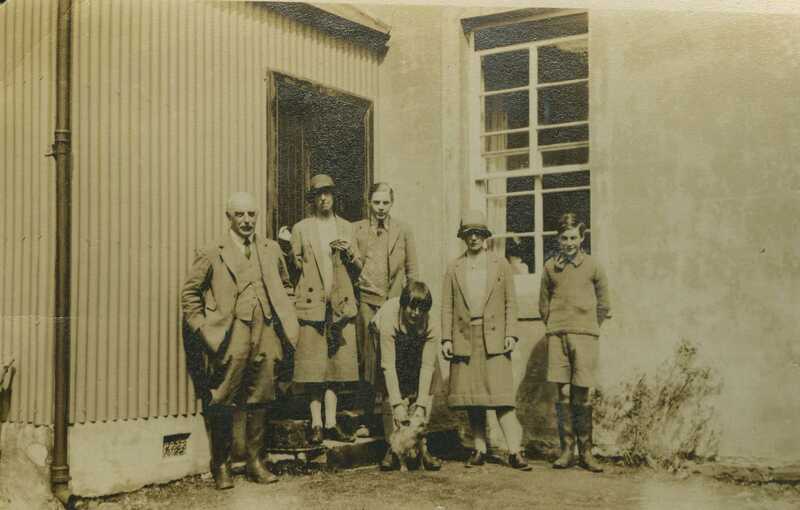 The new works were undertaken according to designs by David Sumsion, the building works carried out by Fergussons of Strachur. This building is the home of Virginia Sumsion and John Pope. The principal west elevation is tripartite of three bays with a central generous entrance, single windows on either side at ground floor level and dormers to either side at first floor level. 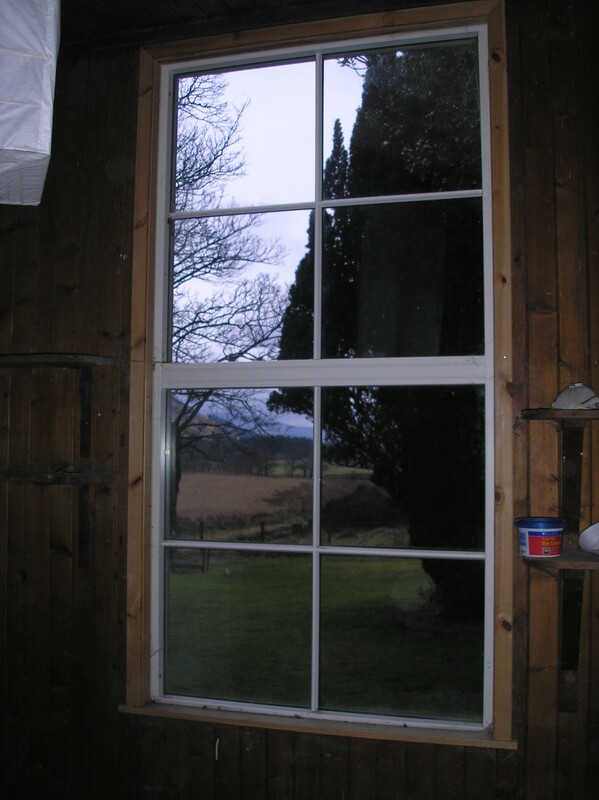 The windows themselves have all been renewed with double-glazed, sash and case units. Dominating this west elevation centrally is a large porch which is secondary. This contains an entrance that faces to the south at the re-entrant junction with the main frontage. The porch structure is timber-framed, erected on a brick-built cement rendered base or plinth; three cast cement steps rising up to the porch itself. The door within the entrance is double-leafed, framed and appears to be part of the new work. Externally the upper parts of the porch are clad with crinkly tin that is directly affixed to the studwork and framing of the superstructure. Internally the entirety is lined out with vertical 3? v-section match boarding with skirting and narrow moulded cornice and a simple architrave around the entrance into the house proper. At the north-west and south-west angles of the principal frontage there are raised margins that may suggest there are dressed stones beneath, although this not confirmed. The eaves overhang somewhat on all sides. 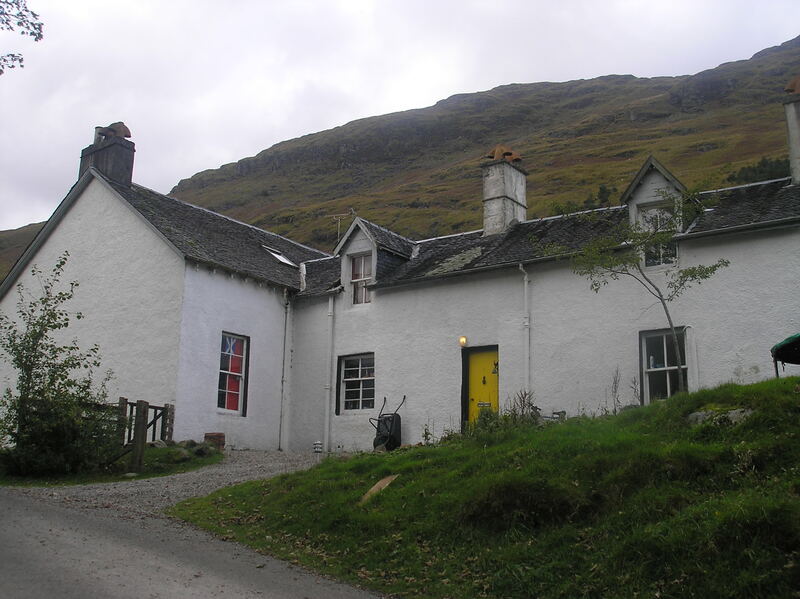 The chimneys have been largely rebuilt and are roughcast. The ground floor windows on the principal elevation do have raised margins, all around; again whether this is dressed stone or formed up is now unclear. 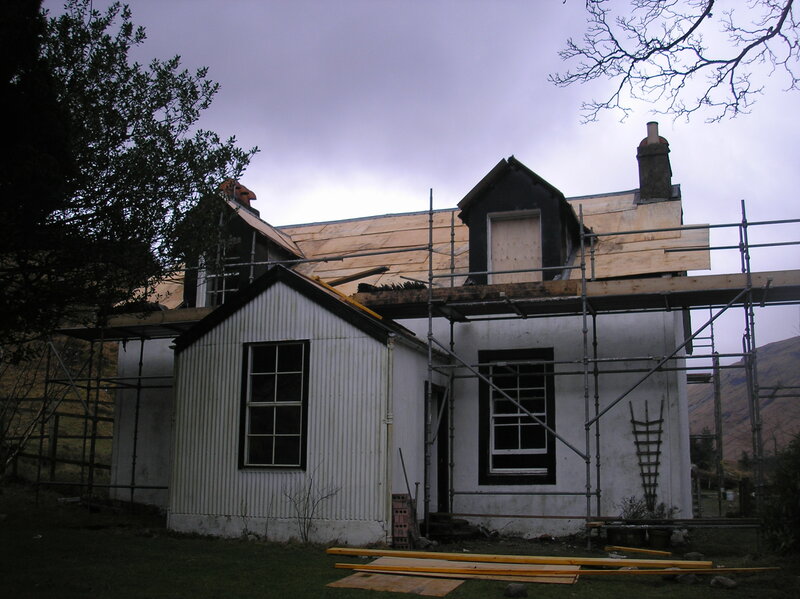 The fronts of the dormers are rendered and the sides are framed and encased in lead. The entire roof structure is new. This is now slated and the slates are new. The roof of the porch is black-painted crinkly tin. The walls throughout are painted in an off-white/cream. 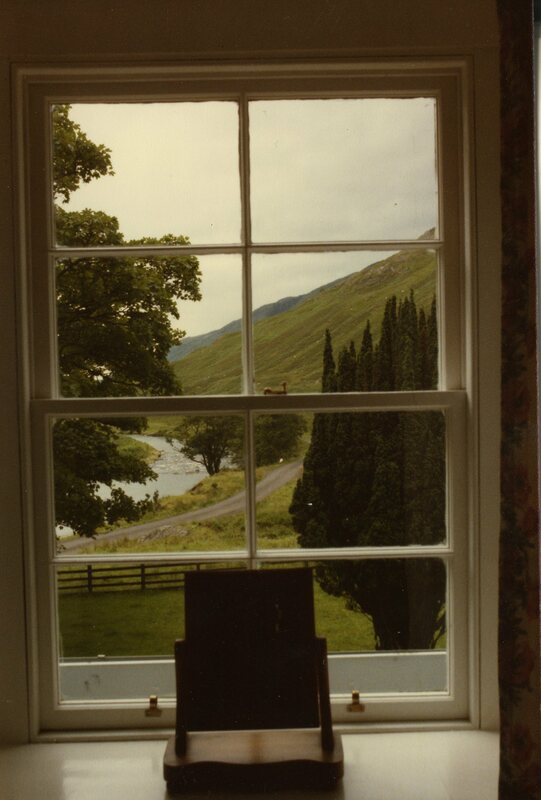 The windows have no surrounds other than sill stones or recent interventions. The sills are of cement. 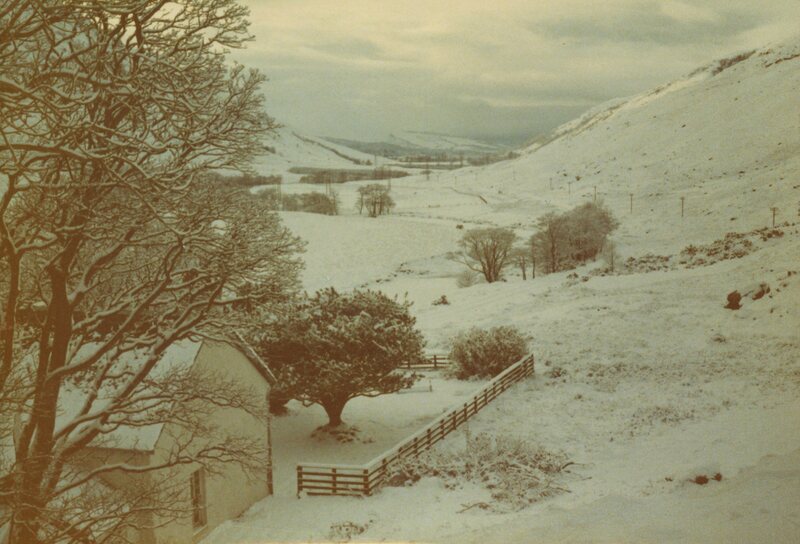 The south facing gable wall of the principal range contains no visible architectural features, it is simply harled over. The south-west corner of the main house has a projecting wall footing course. 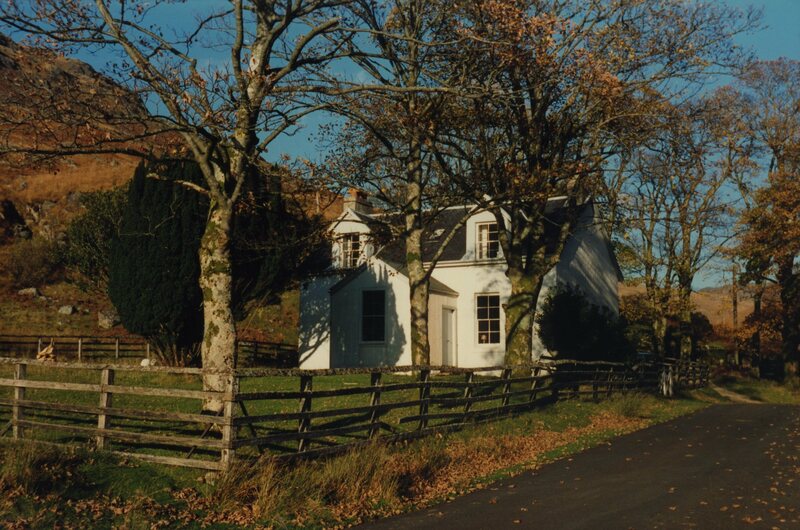 The main western block of the house is generously proportioned and is very deep in plan. The rooms would have been high-ceilinged. The rear jamb, which, compared to the western block is of much more vernacular character and may perhaps pre-date it, is accessed on its south-facing side. 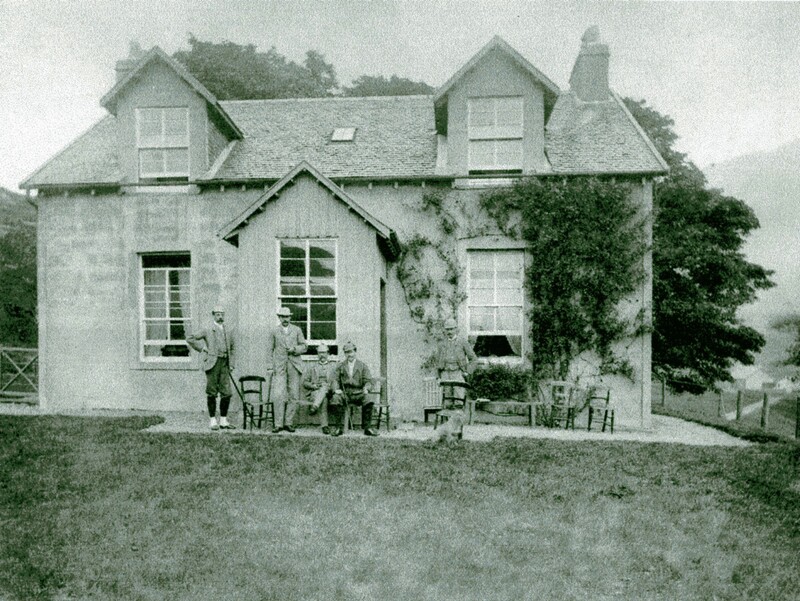 This frontage is of three-bay arrangement with a central, relatively narrow entrance and single windows to the rooms on either side, and dormer windows on either side above. The dormers are timber-framed with boarded fronts and slated sides. The gable wall to the east contains no openings features. 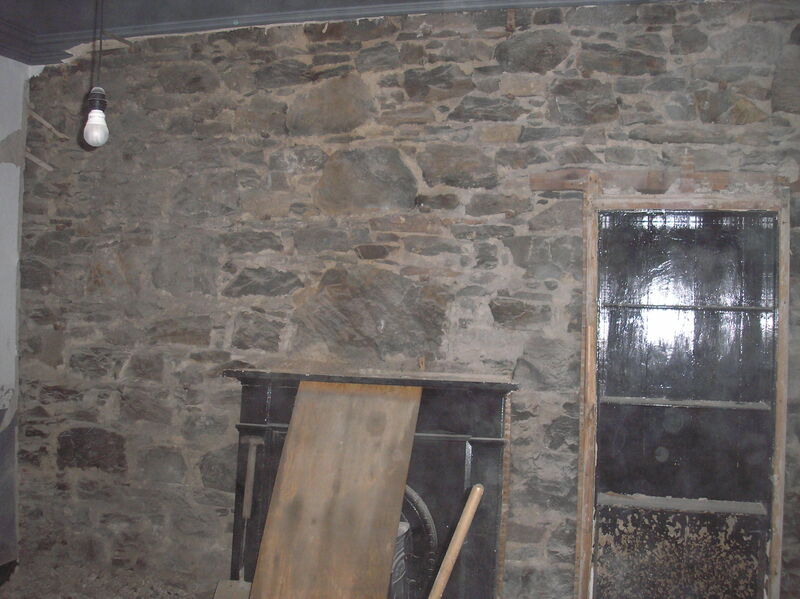 The rear wall is largely obscured by lean-to's; within the larger of these to the east the rear wall of the jamb itself retains extensive traces of original harl and well preserved flush pointing. The harl has traces of white-wash over. The roof of the rear jamb itself appears to be original and is still slated with Scots slates that rise up in diminishing courses. Two chimneys project from the apex, one of which to the west appears early, that to the east appears to be a secondary, possible rebuild of an earlier one. This in brick then rendered over and ruled out. The earlier chimney has a projecting string course half way up and a cope which appears to be cast cement at the top, and appears to have seen some secondary work. There are two lean-to structures built against the north side of the jamb. 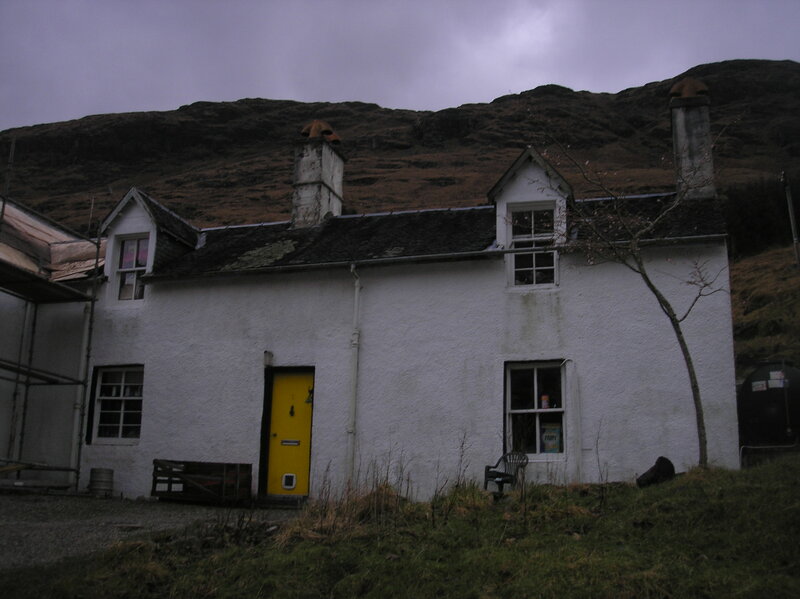 The smaller lean-to appears to be rubble-built; it is harled and painted white. The structure has a single window, slightly offset to the west in the north wall and a felt tiled roof (presumably slated originally). This lean-to is accessed internally from the kitchen ? see section vi below. The east end of the structure is incorporated at the west wall of the larger lean-to. The larger lean-to, at the eastern end of the jamb?s elevation, is a well-built structure of mortar-bedded rubblework that is flush pointed and had evidently been lime washed - externally it retains traces of multiple layers in white and cream. The roof of the larger lean-to is a simple lean-to construction with a single rafter sloping up at low pitch, rising to a wall plate that has been affixed to the rear wall of the jamb; it has a relatively recent corrugated iron roof. It had been entered by an entrance at the west end of its masonry north wall; the east wall of the structure is formed of framed woodwork, boarded externally, and containing the present entrance. As seen internally it is clear that the large lean-to has been built over the smaller lean-to further west, incorporating its east wall.. An existing opening within the latter, visible within the larger lean-to interior, have been a former window; this has a splay that splays out to the west, i.e. into the interior of the smaller lean-to. The window is simply formed up of rubble stone with a granite lintel. 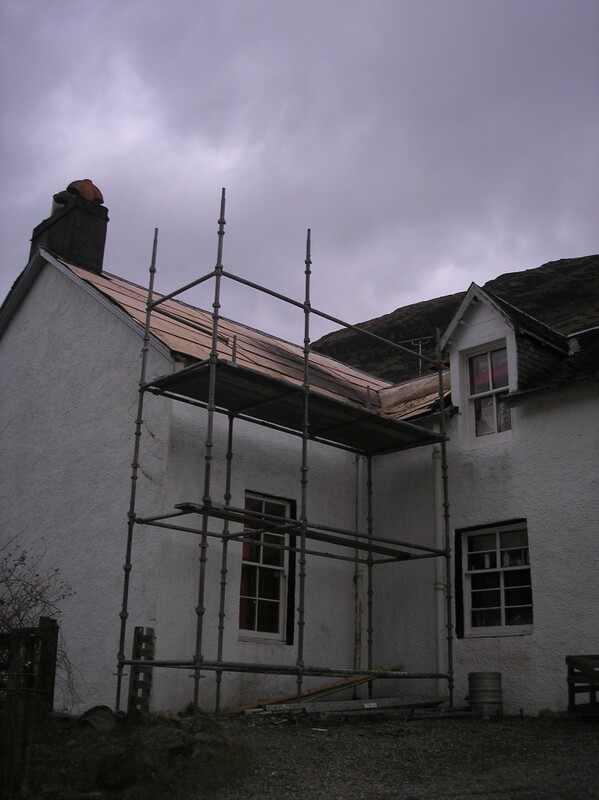 There are traces of early exterior harl on the earlier lean-to, visible internally, and the roof purlins can be seen at the wall-face within the later structure. 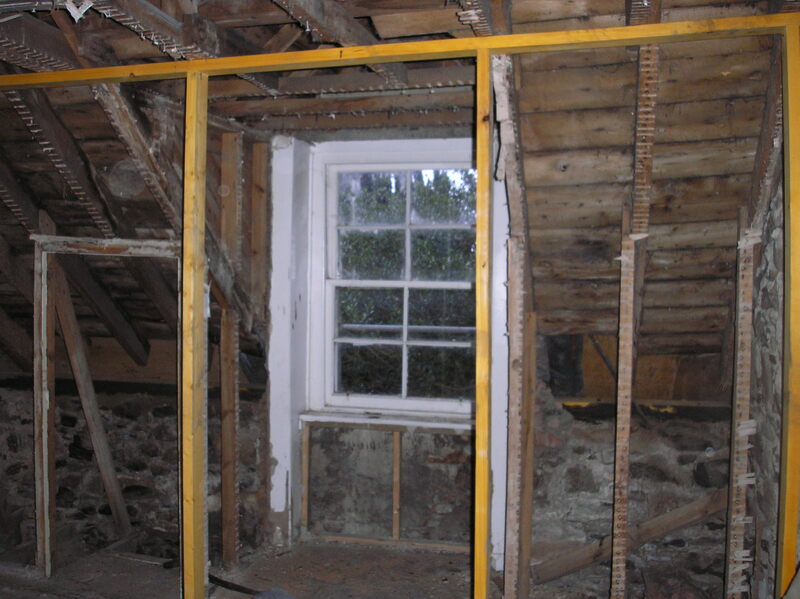 The earlier lean-to itself appears to abut the north wall of the jamb and so is itself secondary, so there are three phases of construction apparent here. 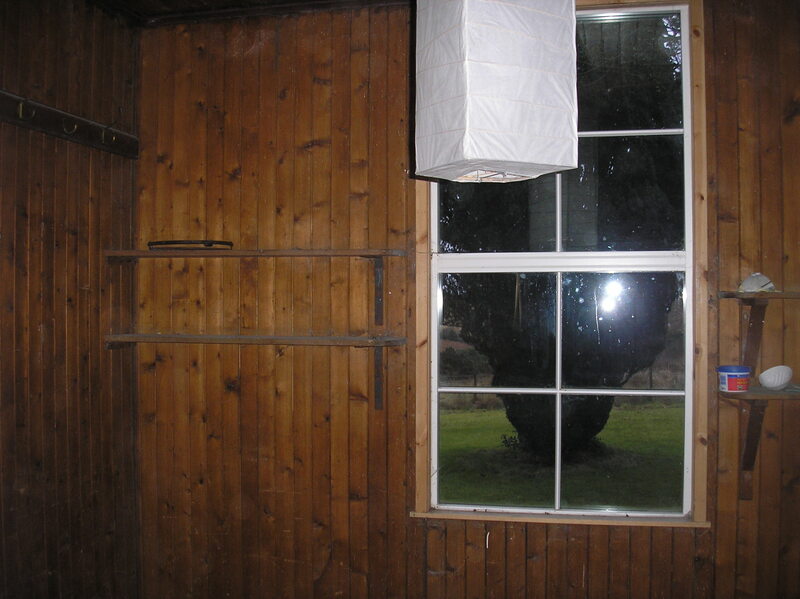 The former window within the smaller lean-to retains its frame inside and a hinged sash that has fly-mesh over. Evidently this smaller lean-to was a pantry. The main entrance accesses the rear jamb from the south, providing access to a vestibule. The main entrance contains a hard-board door of relatively recent date. The range is sub-divided internally by a masonry north-south aligned cross wall into two principal parts. On the east side of the cross wall, the ground floor contains a stair opposite the entrance as one enters. The stair rises up clockwise and there is a small under-stair cupboard adjacent. It has a plank and batten door with a good wrought latch. 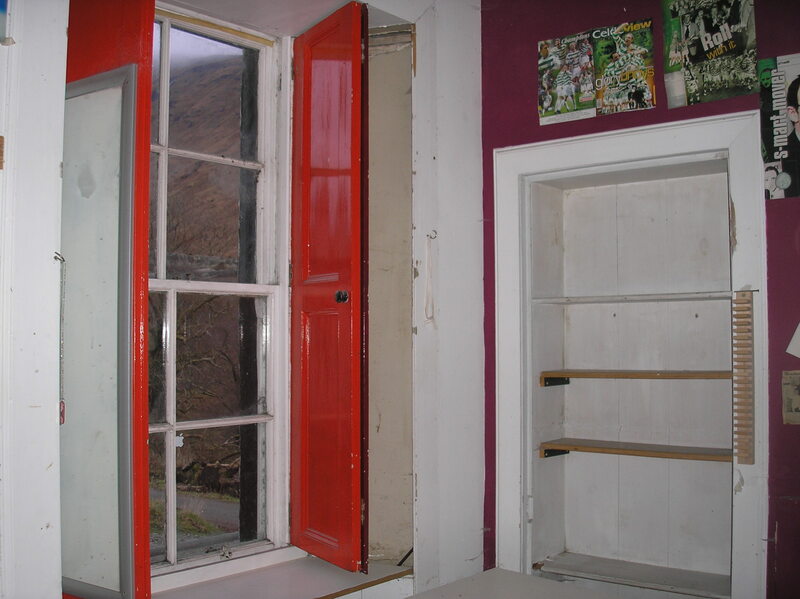 The stair cupboard is plastered on the hard internally. A number of paint layers are visible here - starting with an ochre and then a vibrant pink and a bluey-green on top; these are all early, presumably Victorian. To the right (east) there is a ground floor room, perhaps a utility or wash-house. This is plastered onto the hard internally. The entrance contains a simple plain architrave and a plank-and-batten door inside, tongue and grooved boarding with a bead at the joint. In the east gable wall there is a door to the south, apparently into a press; this is a four-panelled Victorian door. Generally the interior is fairly plain. There is a coat-hook board running along the west and north sides close to the ceiling. An architrave sits above the window to the south. The sash and case within is relatively early with a slightly distorted fillet-and-ovolo glazing bar detail (a broad fillet). There is a ceramic sink within with draining board, all lead lined on top, sink supported by brick piers below. The existing ceiling is of plasterboard, obscuring what may be above. The floor is concrete. The door to the eastern room had had a similar latch to that of the under-stair cupboard, but this was subsequently replaced. 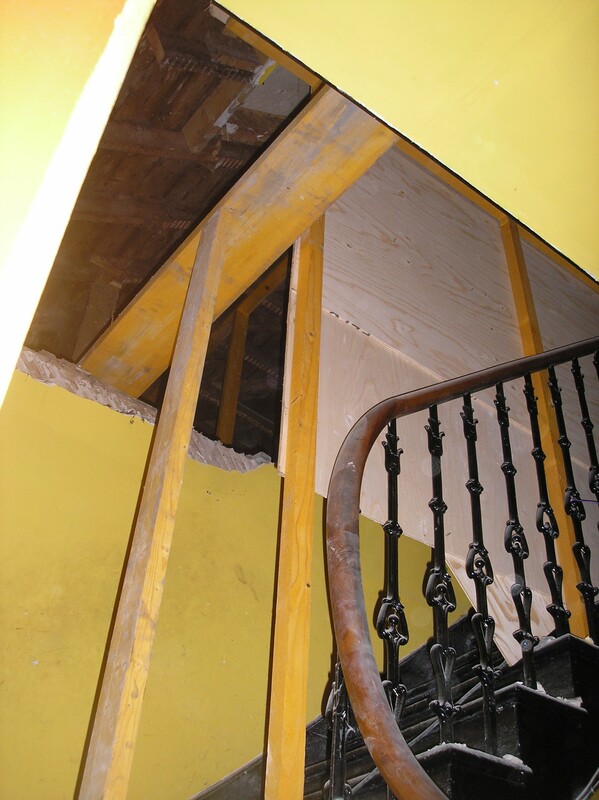 The framing of the stair indicates that the stair itself is early; it has simply formed wooden treads. The stair well is plastered onto the hard internally. The stair rises up clockwise and there is a framed plastered balustrade at the upper level with a simple rounded handrail top. 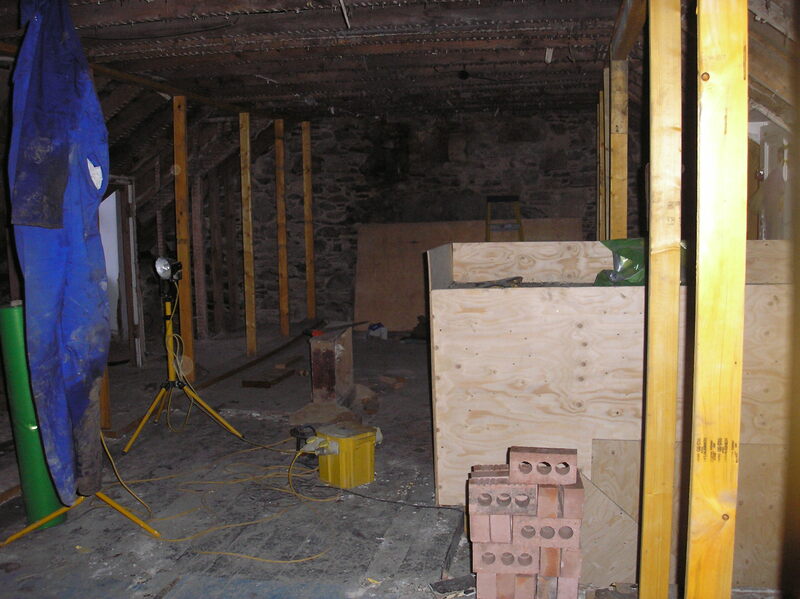 The upper floor is coombed and plastered throughout, the wall plaster extending up to collar beam height. At the head of the stair there is a small landing which provides access to a room to the east, the entrance of which contains a four-panelled door with simple planted Victorian mouldings on both sides. The room within is simply appointed, architraves and skirting?s without moulding, single dormer window to the south containing a sash and case that seems to be formed from salvaged other sash and case windows and not original. 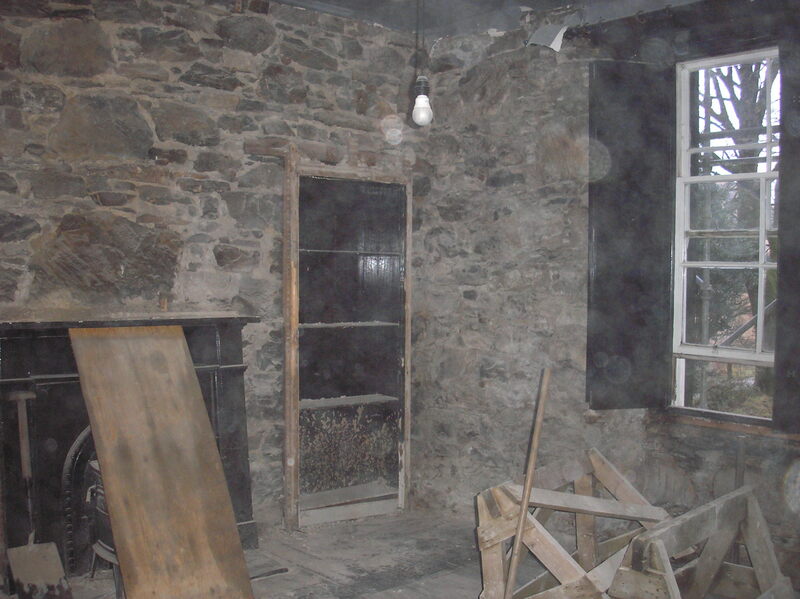 It seems quite likely this chamber was for staff accommodation upstairs and is segregated from the main house. 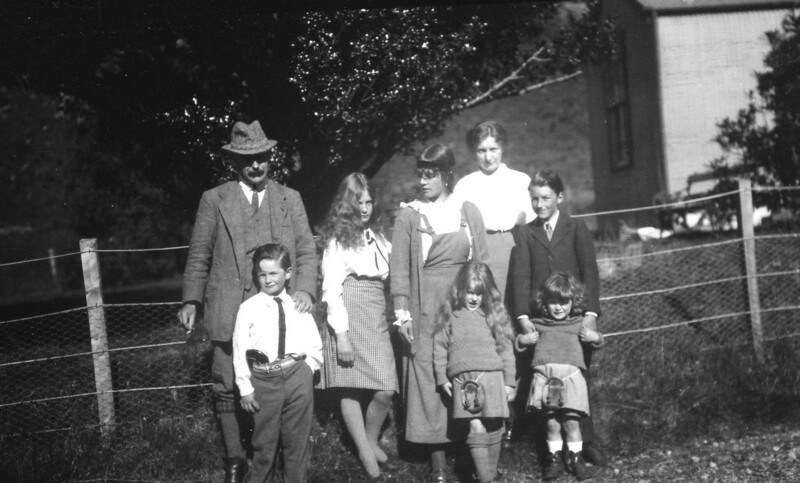 Dot mentions that the MacCallum family who live at Stalker's Cottage in days past would in the winters come down and occupy this part of the Glen Fyne Lodge when the family were not in residence. The entrance into the kitchen within the western part of the rear range contains a good early plank-and-batten door whose vertical boards are detailed with a bead at the joint. Within the kitchen interior there is a large range cross wall to the east, this now containing a dark blue Rayburn. There is a projecting fire surround formed of three blocks of stone, the lintel substantial and tooling visible. Within this there is a cast iron surround, this all of relatively early date (19th century). There is a very substantial stone hearthstone below. The window to the south contains a sash and case that is original, with a narrow horizontal upper sash and panes that are also horizontal. This has a Victorian gothic type of pointed glazing bar profile. Within the window there is a large double ceramic Belfast sink, this supported on brick piers. Wooden floor throughout, the walls are very plain, the ceiling without cornice, simple skirting, architraves of plain board. There is a press to the southwest, this lined out internally and with a plank and batten door. Towards the east end of the north wall there is a small entrance leading into the rear (smaller) lean-to. This again contains a plank and batten door with a good wrought latch. The rear lean-to extension within is quarry tiled within with 12? clean ceramic tiles. The room had evidently been plastered throughout with boarded ceiling. The single window in the north wall contains a fixed six-pane frame with Victorian gothic profiled glazing bar detail. This space, evidently the pantry, is simply shelved out within with a relatively early framed shelf on the south side. The east wall is boarded over (this is where the window was visible with its fly-mesh within the larger rear lean-to. The northeast and west walls are lined out with hardboard. In the kitchen a four-panelled door in the west wall leads into the main house, the western range. The door is detailed with Victorian planted mouldings. 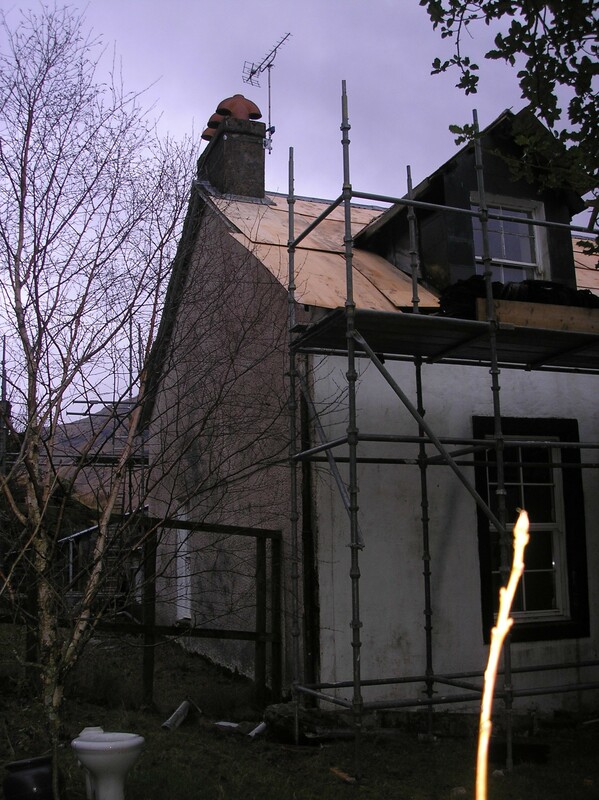 The main house has recently been extensively renovated (2009), the roof taken off and stripped back to masonry throughout and there are archive photographs taken during this process in the Our Houses, Their Stories collection. The door within the main entrance to the main house in the west frontage appears to be relatively early. This is framed with two panels below and six paned glass above. There is a fixed light above the door itself. This is subdivided into six panes. 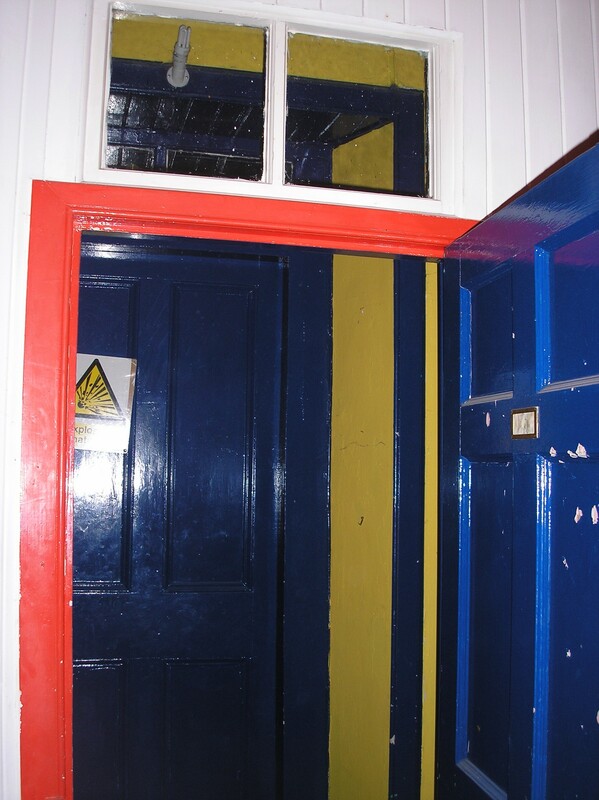 It is possible that the entrance door has been re-set; it has certainly been modified. The principal entrance leads to a narrow entrance hall, clearly the original arrangement (though narrowed on its S side ? 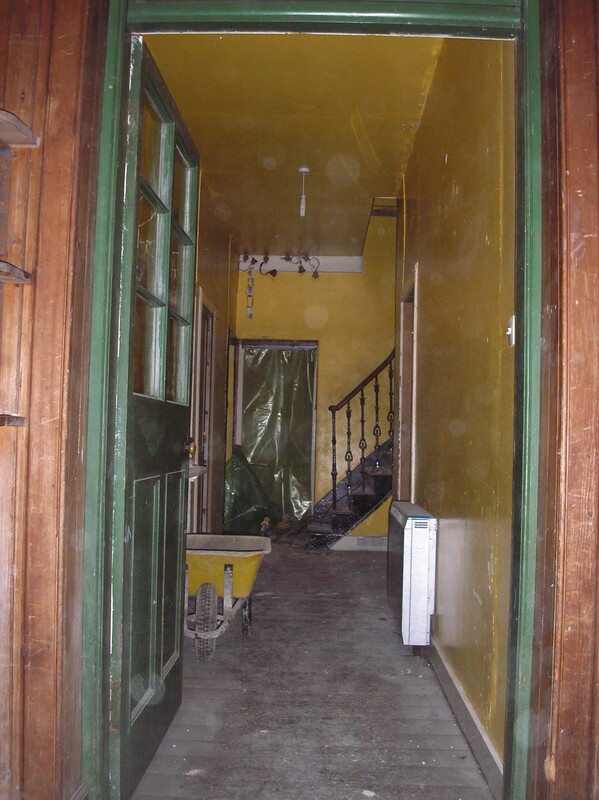 see below) which provides access to the principal stair at the rear of the hall to the east. The stair, which rises up clockwise is an original feature and is finely detailed. It is wooden framed; the treads have projecting bottle-nosings and bear the marks of a carpet, now removed. 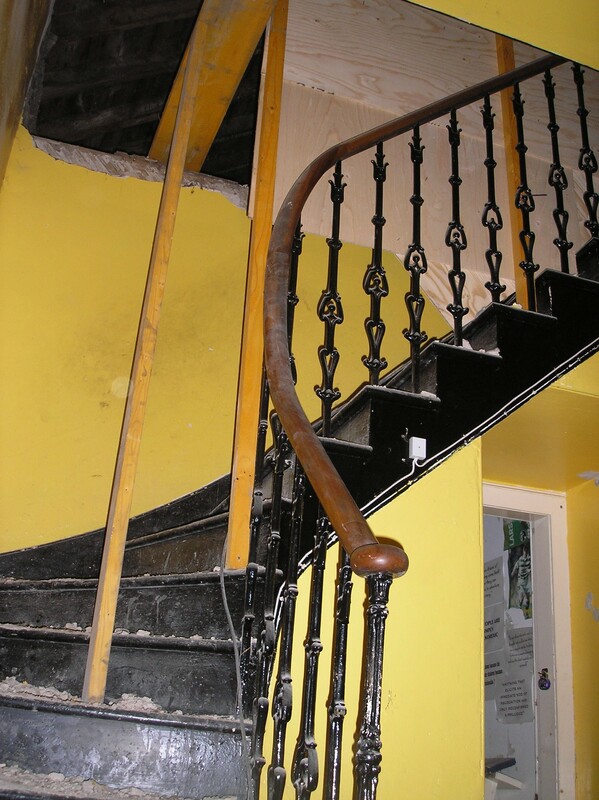 A cast iron balustrade with pine handrail rises all the way to the first floor landing and around the landing, enclosing a narrow central well. There are two large rooms on the north side of the hall. The north-west room has been heavily renovated, but retains the lining of the window ingo within the panel. These had mirrored interiors to reflect light around the room internally. All the linings are modern, but the early arrangement is clear with a central fireplace to the north and a press at the west end of the same wall. In the north-east room again there is a press, at the east end of the north wall. What is now newly reformed into a window at the north end of the east wall had been an entrance into what had been apparently a later lean-to bathroom externally. 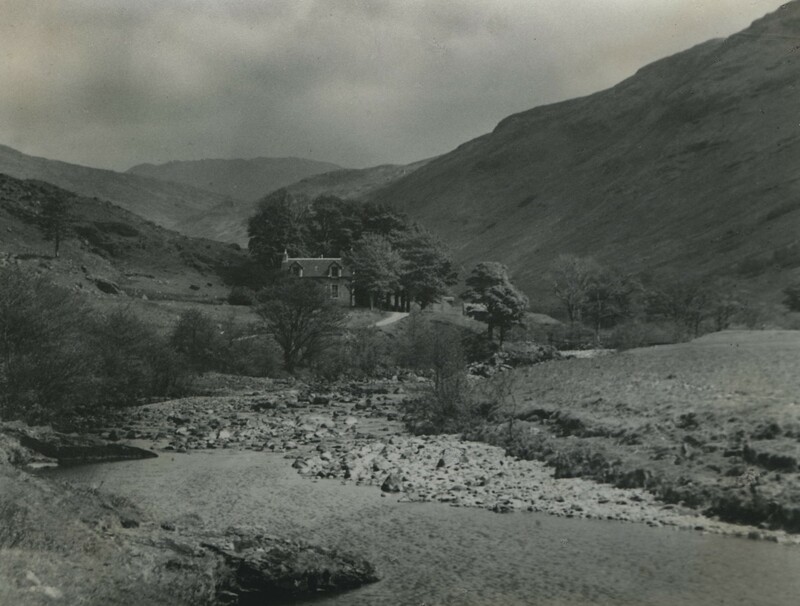 This downstairs bedroom to the north-east has a small brass plate on it saying Grouse Room. The main ground floor room to the south-east is well proportioned. 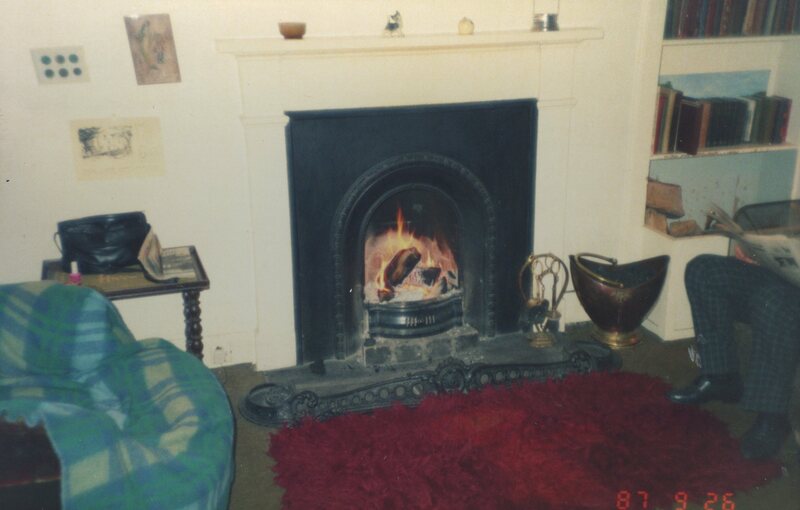 This has a central fireplace in the south wall that retains a wooden fire surround and cast iron fireback within that appears to be early (if not salvaged). There is a press on the west side of the fireplace. The hall and the two principal ground floor rooms to the west all have run cornices that are new. It is possible that the south side of the hall has been narrowed and the principal entrance is now slightly off off-centre. That the wall is not in its original position also seems confirmed because the window in the south-west room is now no longer central to the room. There are under-stair cupboards and a bathroom at the south-east corner of the ground floor interior, this with east facing window. The stair leads to a generous upstairs landing from which all rooms lead off. The principal bedroom to the north is named Salmon Room, the box bedroom called the Trout Room, centre west. South-west a further bedroom is called the Eagle Room. To the south-east there is a large bathroom and shower. To the east off the stair landing there is a further door leading to the River Room. 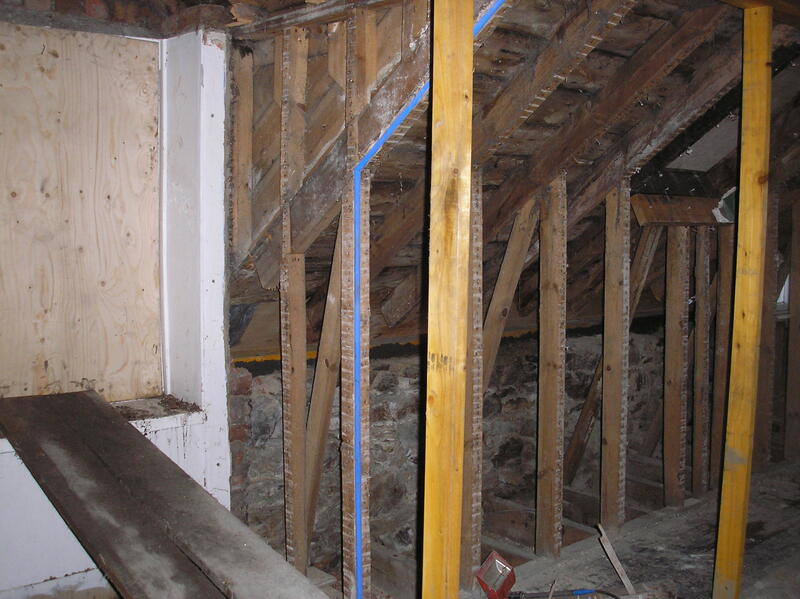 Leading down by three wooden steps into a bedroom; this is located above the kitchen within the rear jamb. This room is plastered internally throughout with plain skirting?s and mouldings. 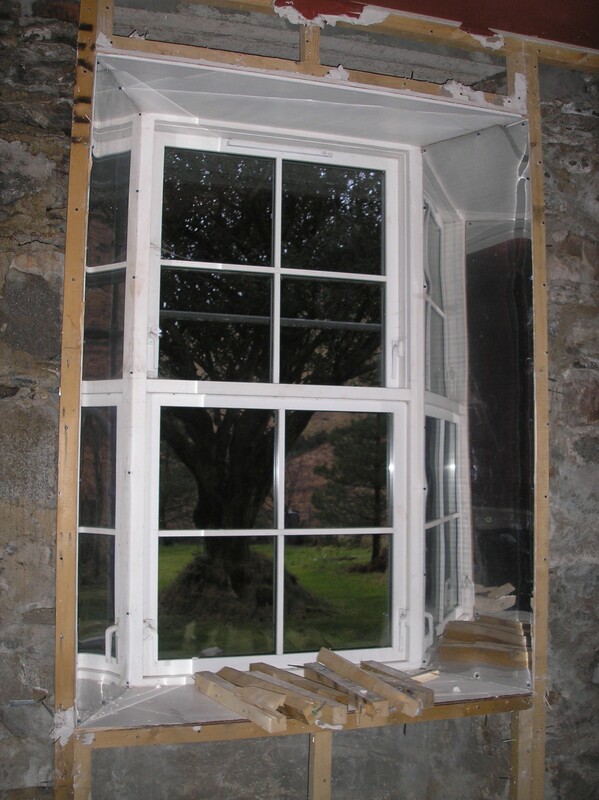 A sash and case window within the dormer to the south; this with simple broad fillet and ovolo glazing bar moulding.